The Smackdown® XR™ line of bullets is designed as a lighter, faster bullet allowing you to extend your range. This traditional lead projectile features a proprietary plating process encapsulating the bullet in copper, which reduces fouling. Additionally, the hard polycarbonate tip and shape of the projectile provides a flat shooting, deep penetrating bullet sufficient for your hunt. 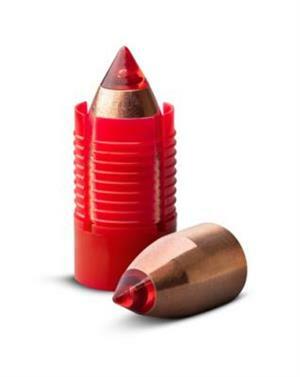 The Smackdown® XR™ bullets come with the Ridgeback™ Sabot. Redesigned from the ground up, our Ridgeback™ sabot creates the perfect gas seal every time. By reducing the thickness of the sabot walls and adding horizontal ridges to the walls the frictional contact area of sabot-to-barrel decreases. As a result this adds extra layers of gas seal – a win-win combination. 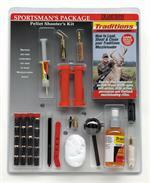 By combining the reduced barrel contact with the deeper base cup, you get the best sabot on the market. Less friction means easier loading while a better gas seals give you more accuracy and reduced cleaning shot after shot. 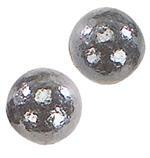 230 Grain, .50 caliber, .45 diameter. Comes in a pack of 15 including sabots. Ballistic Coeff. 0.227.